Automatic feeders are one of the most essential appliances that let you control the diet of your pet. There are several models available that enable busy pet owners to keep their pet well fed on a regular basis. However, you need to select the right feeder that will match your pet’s characteristics. The following list outlines the best models that will greatly minimize the time you need caring for your pets. This is one of OxGord’s recent release. The feeder is designed for all pet sizes. It can be programmed to deliver a specified portion within a certain time schedule. The feeder has a voice recording function that alerts your pet during meal time. The heavy base makes it stable enough to keep your pet from knocking it down. The feeder has a 45 cup capacity. This is a 6-in-1 feeder. 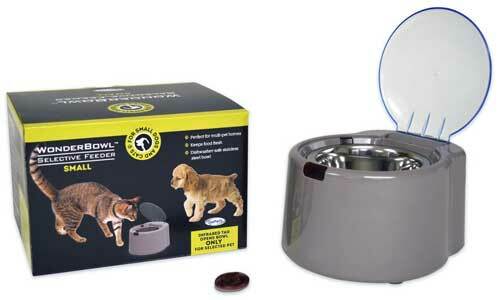 It is designed to cater for the feeding needs of your pet at 6 different times. It features 6 distinct feeding trays that unlock at specified time duration. The feeder is equipped with a voice function for added convenience. 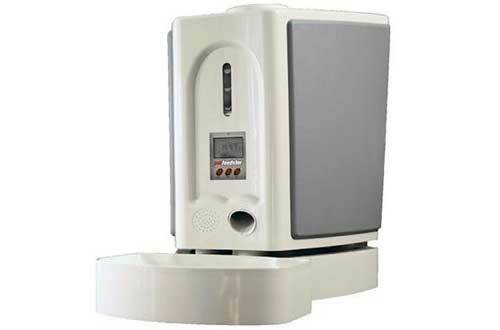 It has a user-friendly LCD display that allows for easy reading. A clock is integrated in the feeder for accurate timing. 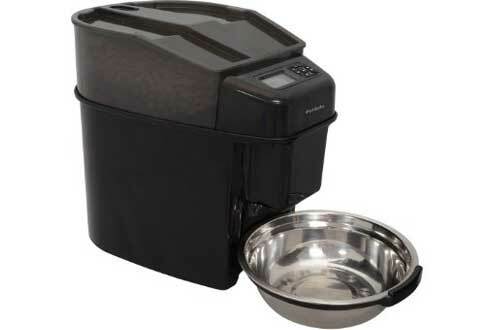 Cat Mate C3000 is specially designed for dry food. 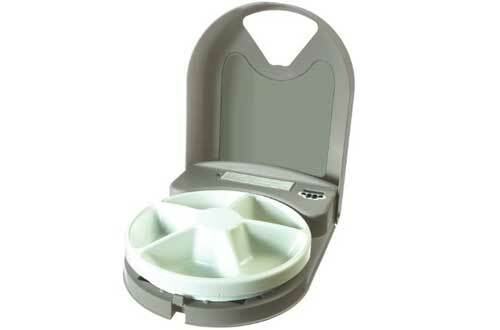 It is a stylish feeder that is programmed to deliver a minimum food capacity of 10 grams at a time. The feeder has a maximum holding capacity of 6.5 pounds. It features a nice LCD control for easy programming. Cleaning it is quite easy, thanks to its dishwasher safe features. The feeder is powered by a pack of 4 cell batteries. This feeder comes in a rugged construction that is guaranteed to last for years. It is made of tough and easy-to-clean polypropylene material. The feeder is made up of 5 different chambers. Each chamber is designed to hold 1 cup of dry food. It comes with a digital timer that enables you to programme up to 5 different meal times. The tray is dishwasher safe for hassle-free cleaning. If you desire a feeder that allows you programme multiple meals a day, then this model has got you covered. It helps you programme up to 12 meals in a single day. The meals are delivered in specified portions ranging from 1/8 to 4 cups. The feeder incorporates a 15-minute slow mode that prevents fast feeding. Other feed modes include immediate and pause modes. This is a 45 cup feeder. It features a see-through design that lets you monitor the food level. The feeder offers the option of a non-stop feeding or you can choose to program the feeding schedule in the range of 1 to 4 times in a single day. 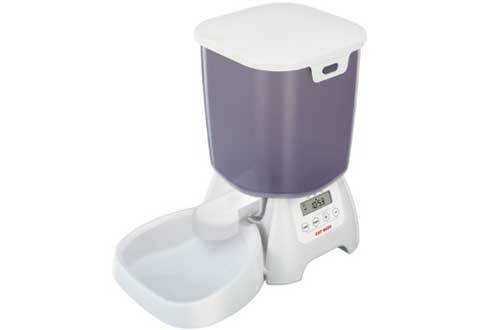 The food portion delivered by the feeder can be set from 0.25 to 2.5 cups. The feeder has an easy to read LCD display. 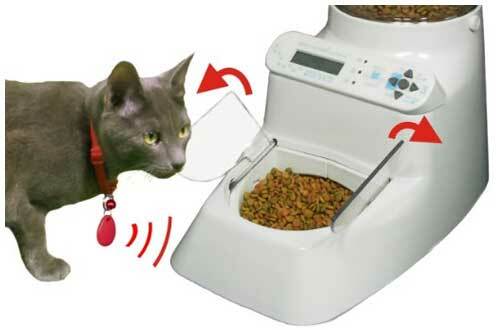 In case you have multiple pets to feed, then this wireless feeder would definitely suffice. 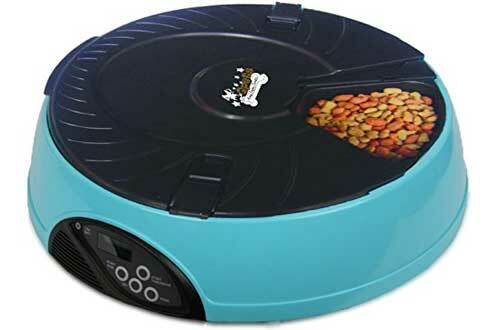 It is designed to accommodate the feeding needs of up to 8 pets. It features a voice function that alerts your pet by name during meal time. This feeder is actually one of the best options that will enable you to put your pets on specified diets. 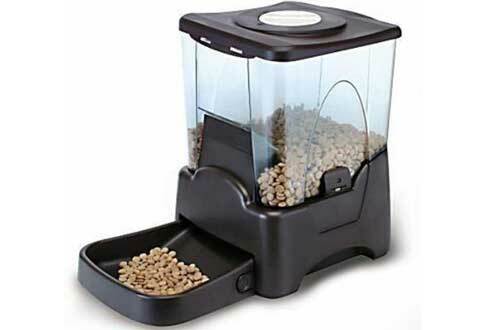 This feeder is meant for households that have multiple pets to feed. It allows only specified pets to feed from the bowl. 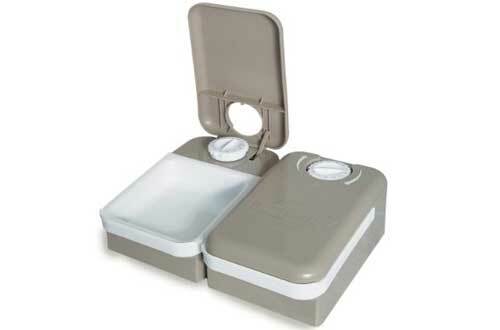 The feeder has a lidded top that serves to keep the food fresh all day long. It has a sturdy base that keeps it from tipping over. The feeder is meant to hold dry food and has a holding capacity of 1.5 cups. It operates on a pack of 3 batteries. 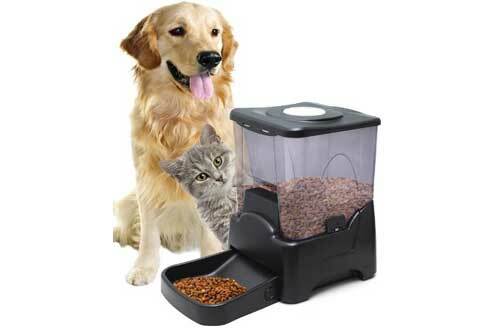 This feeder is designed for both dog and cat owners. It is compatible with both dry and wet food. The feeder features two different feeding trays each having a food capacity of 1.5 cups. It comes with a timer that lets you program meal times to a maximum of 48 hours. Te feeding trays are designed to be dishwasher safe for easy cleaning. This is an energy efficient feeder that works even during power failure, thanks to its advanced power backup. It can be programmed to a maximum of 5 meals in a single day. It delivers a minimum and maximum food portion of 1 teaspoon and 6 cups respectively. The feeder can hold up to 10 pounds of food. The feeding bowl is detachable and dishwasher safe for hassle-free cleaning.